Ideal for those wanting to get off the beaten track away from the tourist centres. Spectacular scenery in some of the South Islands most picturesque spots! Well, to be honest we could say that about pretty much every tour, the place is that good! Punakaiki to the glaciers, beautiful Wanaka and majestic Aoraki Mt Cook. Stunning New Zealand at its best! The drive north from Christchurch takes you through some fine rolling farmland and North Canterbury's major wine region, the Waipara Valley. You then head inland and over the Lewis Pass where the landscape changes to a sub alpine zone with large forests of red and silver beech. Near the summit a short walking track, the Tarn Nature Walk, is an ideal place to break your journey. Maruia Springs has been attracting travellers for years and the natural hot springs are now located within an authentic Japanese themed resort, a great place to stop for a soak if time allows. Reefton sprung to life in the 1870's when gold was discovered (as did many other West Coast towns) but the mining here was so successful and the town became so prosperous that it became the first place in Australasia to have electric lighting. The visitor centre tells a great tale and also has a replica gold mine. 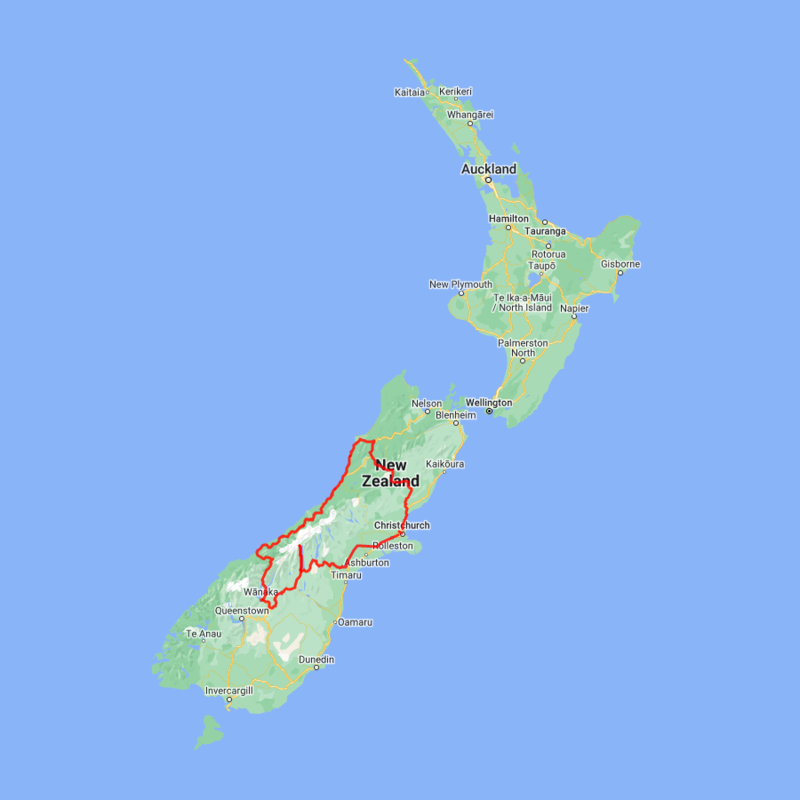 Continuing onto Greymouth and then a short drive along the wild west coast to Punakaiki. Punakaiki is most famous for the Pancake Rocks and Blowholes. Visitors are often less aware of the great many other experiences available. Located in the heart of the Paparoa National Park, the area offers guided beach, forest and mountain walks, canoeing, wildlife, horse trekking, surfing, gemstone hunting, caving and climbing, heritage sites. There are taverns, cafés and restaurants, and a great range of accommodation. The area also boasts a vibrant arts and crafts community and a cooperative gallery. The drive South on State Highway 6 brings you first to Greymouth, the commercial centre for the West Coast. Just south of the town is Shantytown a replica gold rush town with lots of great displays from yesteryear. Continue south and you arrive at Kumara Junction and then along the wild surf coast to Hokitika. Hokitika is a great place to explore, especially the craft stores as the jade or greenstone on offer in Hokitika is probably some of the best you will see in the country. The Hokitika Gorge, off the beaten track and inland a little is a spectacular detour. Turquoise waters flowing through a narrow gorge. A great short walk will deliver you to this piece of paradise. Leaving Hokitika you’ll go through the old gold mining town of Ross where some of the original buildings and workings remain. Ross is also home to one of the few working mines left in New Zealand. Continuing South you’ll pass through Harihari, the township Guy Menzies crash landed in after he became the first person to fly solo across the Tasman. Continue on through Whataroa, a small township, home to some of the world's rarest birds - the New Zealand White Heron and the Kotuku. Arriving into the glacier region you’ll catch your first glimpse of the Franz Josef glacier before coming into the township - a lively place with a great atmosphere. Kayaking is by far the best way to enjoy the flora, fauna and scenic grandeur of New Zealand's largest unmodified coastal wetland. Previous experience is not necessary. Okarito Lagoon covers more than 3240 hectares of shallow open water and is well known for its outstanding bird life, including white heron and royal spoonbill. Exploring the open water and river channels that lead you deep into the heart of the rainforest is like stepping back in time to pre-European conditions and on a clear day you enjoy fantastic views of Mt. Cook and the Southern Alps. Your guide will take you to their favourite spots where you'll discover the flora, fauna and history of the lagoon. The Jet Boat and walk is a half day guided trip that begins with a thrilling jet boat tour up the Matukituki Valley. You will watch the stunning alpine scenery pass by, as you speed up the river. The Matukituki Valley is an area made famous by the Lord of the Rings and Hobbit movies. You will be surrounded by beautiful scenery and towering mountains. Speeding along, you will quickly understand why jet boating is one of the must do tourist attractions in New Zealand. Take in the awe-inspiring views of Mount Aspiring and Avalanche Glacier. Stopping at the top of the river, leave the jet boat for a 50 minute guided walk through beautiful New Zealand landscapes. Alpine meadows, forests and waterfalls can all be seen. The Wild Hills is an authentic four-wheel drive journey that travels the private back-roads of an iconic West Wanaka Station. This adventure will take you high into the mountains overlooking Lake Wanaka and you will get to view the glaciated snow-capped peaks of the Mt Aspiring National Park. An expert local New Zealand guide will bring the history, heritage, spectacular scenery and in-depth knowledge of farming practices to life for you. Enjoy leisurely nature walks, freshly brewed coffee and home baking at the private mountain-top café. Lend a hand with our predator control programme by helping check a trap line we maintain. Passing through the Clutha River valley you arrive into the quaint village of Tarras, which has a number of boutique stores and a lovely café. You then traverse the Lindis Pass, one of New Zealand’s highest roads with the summit reaching 971 metres. The tussock covered hills offer an unusual contrast as you pass from Central Otago into the Mackenzie Basin. The towns of Omarama and Twizel are the last stops before you arrive at Lake Pukaki and take the Mt. Cook Highway along the shores to the village. In Mt. Cook Village a myriad of activities are available from scenic flights with glacier landings, to kayaking on a glacial lake and a host of walks to suit all abilities. At The Hermitage Hotel the Sir Edmund Hillary Alpine Centre is a must see. Please note there are no food or shops at Mount Cook you will need to stock up prior to arriving in Mount Cook if you wish to self cater.